Great bold pencil signature with fantastic provenance! Acquired directly from a relative of person who met Sinatra and obtained the signature. Offered for your consideration in this auction is an autograph in pencil by Frank Sinatra signed on the inside of card stock from the Wedgwood Room where Mr. Sinatra performed with Leo Reisman and his orchestra. 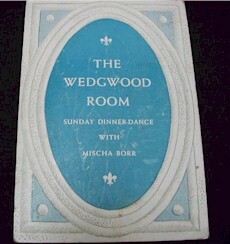 This item is from the estate of my late Aunt Ramona. There is a newspaper clipping that authenticates the signature. 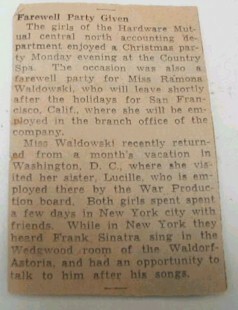 It reads in part, " Miss Waldowski recently returned from a month’s vacation in Washington, D.C. where she visited her sister, Lucille, who is employed there by the War Productions board. Both girls spent a few days in New York city with friends. While in New York they heard Frank Sinatra sing in the Wedgwood Room of the Waldorf Astoria, and had the opportunity to talk to him after his songs." The original newspaper article will be included with the auction. Signature is much larger and darker in person. 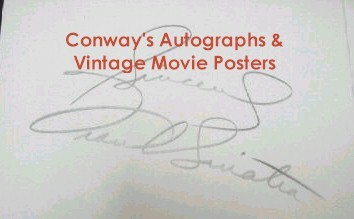 One of the LARGEST Sinatra authentic signatures we have ever seen!! About 5-6 inches long!! And, as always we guarantee authenticity for life! And as always don't ever buy autographs, especially high-end like Sinatra on ebay (unless you are REALLY experienced with his signatures) . Approximately 99% are fake.